Here's my card for the current sketch at Match the Sketch. I used images from Verve's Coffee Please digital stamp set to put this one together. After coloring the coffee cup image with Copic markers, I carefully cut it out, then used foam tape to adhere it to the sentiment panel. For interest, the panel was cut out with a pierced square die. I matted the sentiment panel on orange cardstock, then adhered it to a plaid patterned paper panel over a strip of orange grosgrain ribbon from my scrap pile. 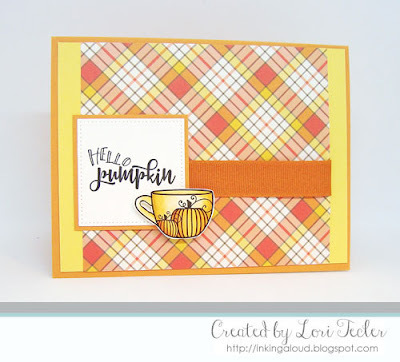 The plaid panel was adhered to a coordinating golden yellow cardstock panel, then adhered to an orange card base. thank you for sharing our Challenge. Your Card ist really beatiful.